It was a week with a thrilling finish and intense Italian flavor. CSKA Moscow and Real Madrid remain perfect on the standings of the Turkish Airlines EuroLeague, there were no real surprises in the results, but with an MVP from Italy and a coach of the week from the same country, the pattern is obvious. And both of them are tied as Fenerbahce and AX Armani Olimpia Milan are sharing the third spot of the standings with a 4-1 record. He is a scorer and he proved it with 19 points (6/8 FG, 3/4 FT) and by making some of the most crucial shots of the night in Fenerbahce‘s close win over Bayern Munich. The Germans pushed the hosts to the limit, but in the end, Datome and his teammates were able to tame the storm. Nick Calathes: It was not his best night, but he almost got a double-double with 10 points (5/10 FG), nine assists, four rebounds and three steals, being the brains of Panathinaikos as usual in the road win against Buducnost. Tony Crocker: With all eyes on Alexey Shved, he was more efficient in Khimki Moscow’s win over Gran Canaria with 17 points (6/10 FG, 2/2 FT), four rebounds and two assists. Will Clyburn: He played almost 36 minutes in the big game against Olympiacos and he did a bit of everything for CSKA Moscow with 17 points (7/12 FG, 3/4 FT), nine rebounds, one assist and four steals. 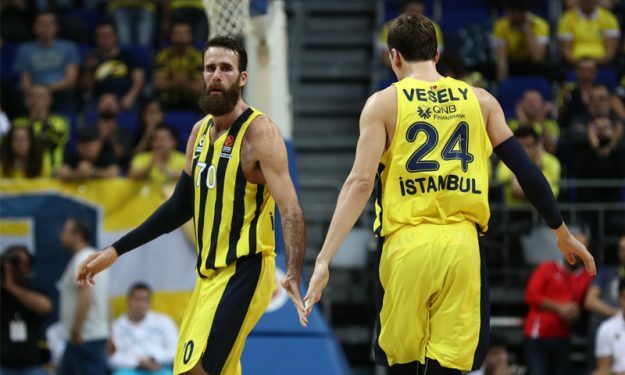 Gigi Datome: He was there when Fenerbahce was in need of him. Gustavo Ayon: Even if Rudy Fernandez was the guy who decided the outcome of the game between Real Madrid and Zalgiris Kaunas, Ayon had a double-double (13 p. 10 r.) plus he got four assists and three steals. By the numbers, he is the MVP of the week. Both AX Armani Exchange Olimpia Milan and Anadolu Efes have a great start this season. Both flirted with disaster in the last game of the week. But thanks to Mike James amazing shot, Milan prevailed and the credit goes to coach Simone Pianigiani. First of all, he trusted his star, despite his bad shooting night. However, the most important thing is that he has created an environment in which many top-level guards can co-exist and create magic. Milan is one of the teams to watch this season. There are many rivalries in sport, but when it comes to the modern era of the EuroLeague, nothing beats the games between CSKA Moscow and Olympiacos.